Sun., June 17, 2018, 1:30 p.m.
A new competitor wants in on Seattle’s hypercompetitive, polychromatic bike-share landscape. Uber, the ride-hailing behemoth, plans to launch with its newly acquired, bright-red JUMP electric bikes. Uber bought JUMP, a bike-share startup, for an undisclosed amount in a deal that was announced in April, but finalized within the last month. The company is waiting for Seattle to set up a permanent bike-share permit program before it commits to the city. The Seattle Department of Transportation (SDOT) has been working on finalizing a permit program for bike-share operators for most of this year. In a process that has been repeatedly pushed back, SDOT says the plan is to present a proposal to the City Council in July. The three bike-share companies currently operating in Seattle are on one-year permits that expire in July. Those companies have operated with nearly free rein on city streets – paying only minimal fees – in exchange for giving a wide range of data to the city. They’ve turned over the kind of usage and ridership data that Uber has long fought, and continues to fight, to keep secret in its ride-hailing business. The arrival of JUMP, backed by Uber, would heighten the competition among the companies that’s brought 10,000 bikes, available for low-cost rental, scattered in nearly all corners of the city. 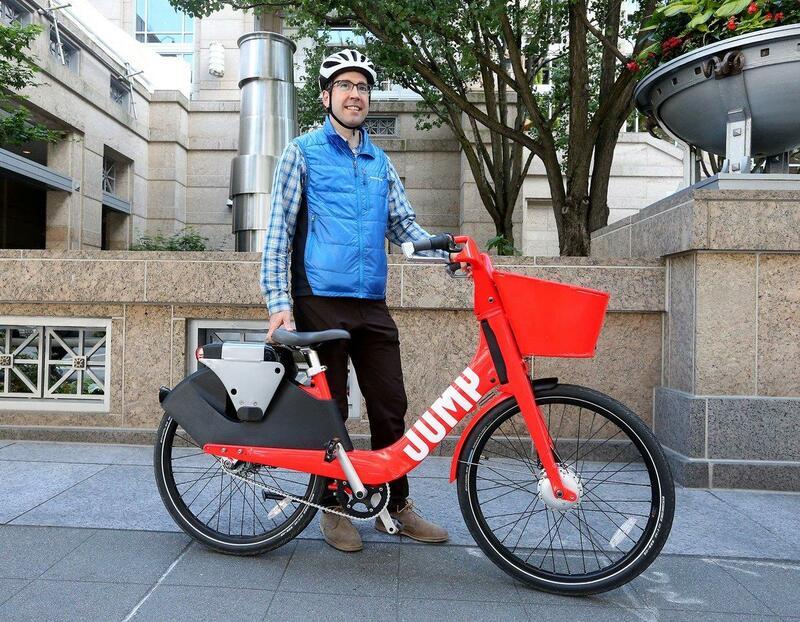 JUMP recently wrote to SDOT and the City Council urging them to adopt policies – prioritizing e-bikes and requiring bikes to be locked to a physical object – that would favor them over the other companies. The red bikes – which along with orange Spin bikes, yellow ofo bikes and green Lime bikes would cover Seattle streets with a majority of the ROY G BIV color spectrum – are different from the others in a couple of significant ways. Like the bike shares already here, the JUMP bikes have no stations and can be left pretty much anywhere. But unlike the other bikes, JUMP bikes do not lock to themselves, they’re meant to be locked to something when not in use, ideally a regular bike rack. Spin, ofo and Lime bikes all lock with a mechanism that goes through the rear wheel. On a JUMP bike, a U-shaped piece of metal detaches from the bike and then locks the bike to a bike rack or other object. When you’re riding, the lock slides into a slot on the rear wheel. That could be a partial solution to the most vocal complaints about Seattle’s bike-share experiment to date – bikes parked haphazardly, blocking sidewalks and businesses. Mafara Hobson, an SDOT spokeswoman, said the city’s forthcoming regulations will try to address that issue. “SDOT recommends a strong proactive approach to manage bike-share parking, ensuring that the companies keep sidewalks, curb ramps and transit access clear,” Hobson said. She said the agency’s regulations – which will need City Council approval – would also likely raise fees on the companies and focus on equitable access in all neighborhoods. The other major difference is that the JUMP bikes are unlocked by typing in a personal ID number and pass code, rather than by scanning with a smartphone app. This, conceivably, could make the bikes more accessible to people without a smartphone, although an app is still used to find bikes on a map and to sign up for the service. The bikes, which are operating in San Francisco; Washington, D.C.; Sacramento; and Santa Cruz, can be accessed via the JUMP app or the Uber app. JUMP says the bikes also can be unlocked with an ORCA card, although you would still pay with a linked credit card, not with the ORCA card. The e-bikes are electric assisted – you still need to pedal, but an electric motor (capped at 20 miles per hour) kicks in to help you, especially on hills. At $2 per 30 minutes, they’re more expensive than the nonelectric bikes available in the city, but a little cheaper than Lime’s e-bikes. Published: June 17, 2018, 1:30 p.m.